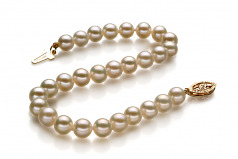 Elegant and Graceful are always welcomed words when describing a quality strand of beautiful pearls. With a 5-5.5mm size, this petite white freshwater pearl bracelet keeps the elegance and graceful side in check but adds the definitive way of charming to its name. 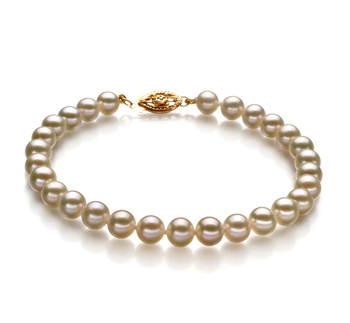 Designed for a smaller framed lady or for the woman who wants the timeless elegance of pearls but not the responsiveness of the bigger size, these pearls are a source of modesty for the graceful or quiet woman. With the (AAAA) across the board grading, the quality is an equal match to the natural glow of the woman behind the elegance and grace. From the amazing shine of their luster to the flawless shape these white freshwater pearls are sure to be a sensation with any fashionable wardrobe you already own.